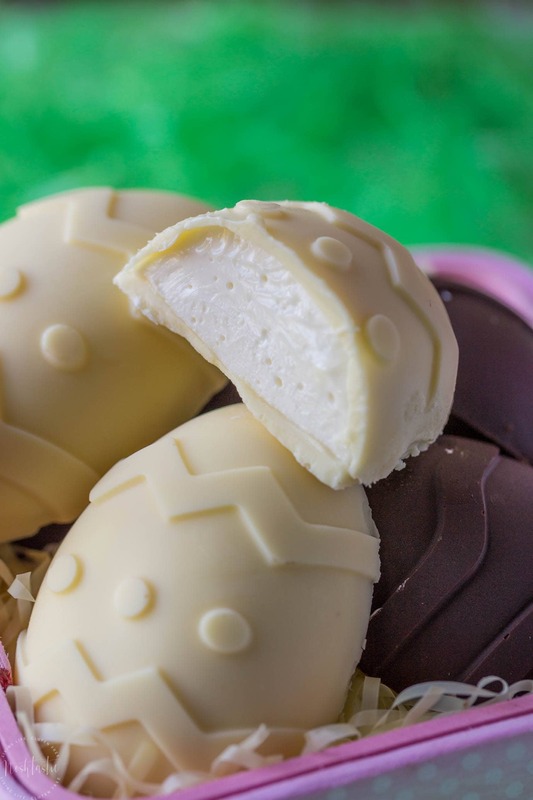 You’ll LOVE my Homemade Chocolate Eggs stuffed with Cheesecake, they are rich, delicious and a real no bake Easter treat! Y’all, these eggs are so decadent and rich, but they are so easy to make. There’s no cooking involved so they are perfect to make with your kids, they’ll love them! I’m going to make them for my family for Easter. First, choose a good quality chocolate for this recipe, one you would like to eat and not a cooking chocolate. Second, melt half the chocolate and add it to the egg molds taking care to spread the melted chocolate up the sides. Next, add the gelatine to water and set it to one side. Now you need to mix the cream cheese, lemon juice, and condensed milk in a large bowl until smooth, then add the dissolved gelatine and mix again. When the first layer of chocolate has hardened in the mold you can add the cheesecake mixture and then let it set up in the fridge. Lastly, melt the rest of the chocolate and carefully spread it on the back of the set cheesecake and let it harden, then enjoy! If you have leftover cheesecake mixture you can add it to ramekins and let them set up in the fridge! I made these eggs in a larger silicone egg mold with 6 ‘eggs’ in it. They are quite big, the egg cavity is about 3.5 inches and it makes for a very rich treat which my kids loved, but it was too much for me so I cut the eggs in half (warm the knife in hot water first to cut through the chocolate). Another alternative would be to buy a similar mold with smaller eggs like this one. You’ll need either a stand mixer like my Kitchen Aid, or a simple hand held mixer . Don’t forget your mixing bowl and spatula! You’ll need to scrape down the bowl with the cheesecake mixture several times. More gluten free sweet Treats! Are you looking for more easy gluten free recipes for your family? I have a few I think you’ll love. My favorite cake recipe is my gluten free chocolate cake, it’s my go to recipe for family birthday cakes. I’m also loving this No Bake Cheesecake recipe from Gluten Free on a Shoestring, it’s made in a similar way to my cheesecake stuffed eggs and would be a great option to make with your kids. Or, what about a cookie recipe? Some of my most popular cookies are my gluten free lemon cookies and my gluten free chocolate chip cookies that mimic the popular Tate’s Bakery cookies. I have a short video showing you how I made the eggs, it's right above the recipe here so make sure you watch it! Melt half the chocolate in your microwave, or in a bowl placed over a shallow pan of simmering water until it melts. I usually microwave it for about a minute, then stir, then microwave in 10 second bursts until it's ready. 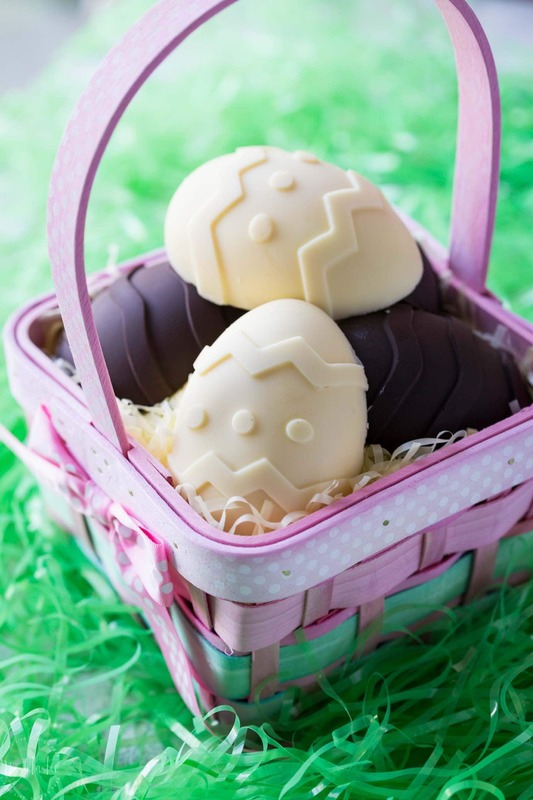 Add a generous spoonful of chocolate to each cavity in the egg mold, you want it about 1/3 full. Then use a spoon, or a pastry brush, to spread the chocolate in a thick layer up the sides of the mold. 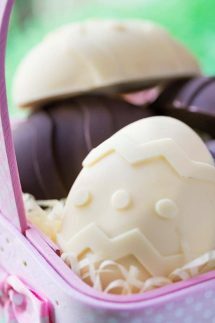 Put the chocolate egg mold in the fridge until it hardens, about 10-15 minutes. Mix the gelatin powder with 1/4 cup hot water and mix until dissolved, then let it cool for a few minutes. Add the lemon juice to the cream cheese, then the canned condensed milk a little at a time and mix thoroughly until smooth. Add the gelatin mixture to the cheesecake mixture and thoroughly mix. Now spoon the cheesecake mixture into the egg molds and level it out to just shy of the top of the mold, leave enough room so that you can add the back layer of chocolate. 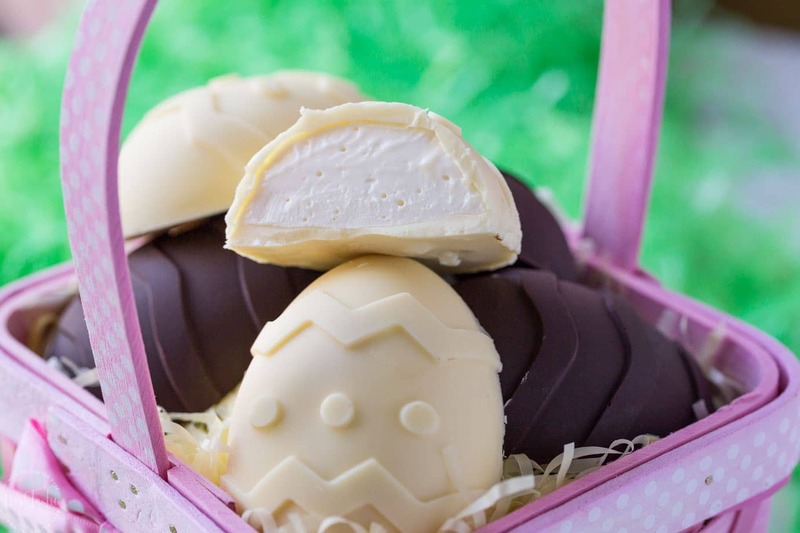 Place the cheesecake filled eggs into the fridge and let them sit for at least 30 minutes. Melt the rest of the chocolate and spoon and smooth it over the back of the eggs and return to the fridge for another 30 minutes. NOTE: If you have leftover cheesecake mixture you can add it to ramekins and let them set up in the fridge, it's very yum on it's own or with a little crushed cookie added to the top. Lol! Thanks Loretta, they were super popular with my kids, I’m sure you’ll love them!